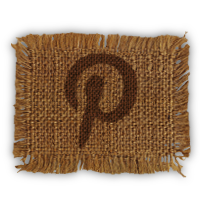 I hope you aren’t tired of all the recipes I’ve been posting lately. These next two are actually reprints of recipes I posted back in 2009. They are so good, however, that they’ve become Thanksgiving favorites. Both recipes serve about 8 people. 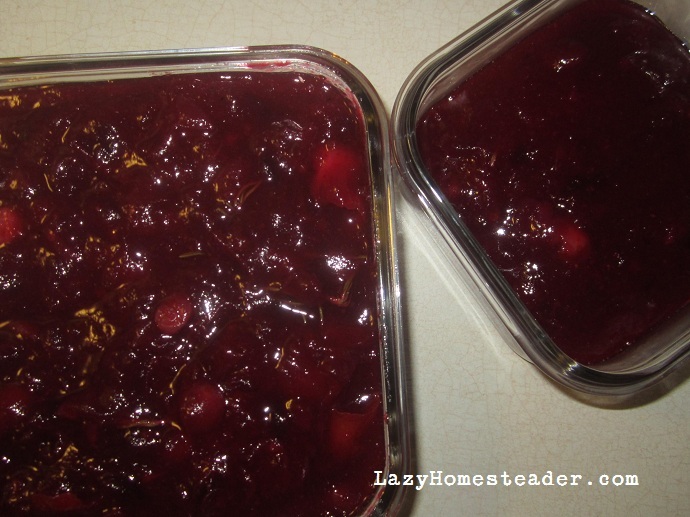 I really love this cranberry sauce. I have a couple of family members who still prefer the can shaped stuff, but this has been a hit with the rest. It makes a large batch, which means leftovers and that makes me happy. Rinse and drain cranberries. 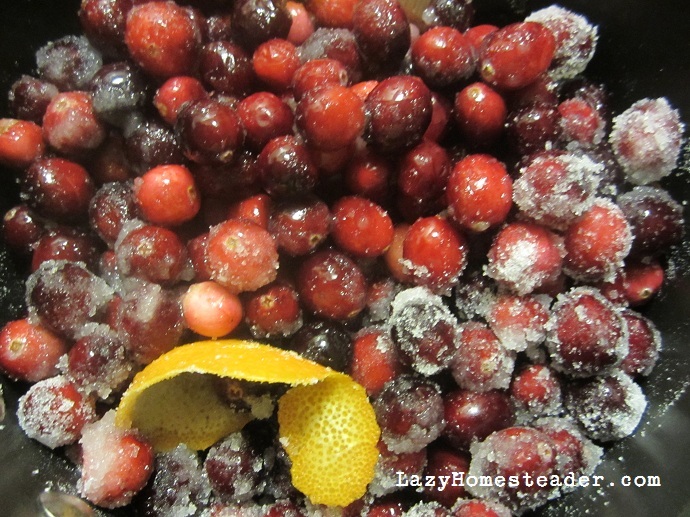 In a large sauce pan, add cranberries, sugar, orange peel and water. Over medium-high heat, bring to a boil. Reduce heat and let simmer 15 minutes. Add rosemary sprigs and simmer 5-10 minutes more. Remove from heat, and stir in orange juice. Reserve 1 cup of sauce for the pie. Let cool, cover and refrigerate for up to a week. To serve, bring to room temperature and remove rosemary and orange peel, garnish with a fresh rosemary sprig. The next recipe is a pie that went from a way to use up that leftover cranberry sauce (a great way), to a planned Thanksgiving day dessert. Rick looks forward to this pie all year long now. I typically use frozen peaches that we harvested from the Western slope in the summer time. Fresh peaches would certainly work as well, but they are not really at their peak around Thanksgiving. Sometimes the frozen peaches release A LOT of juice. If they are super juicy, I throw a handful or so of rolled oats into the pie filling to soak it up. This is totally optional, of course. If you don’t like oats in your pie, just pour off some of the excess juice before adding the peaches into the filling mixture. Preheat oven to 375°. 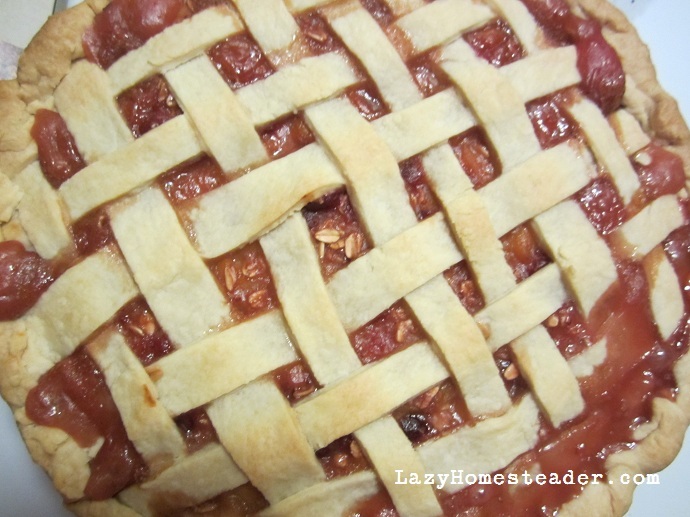 Put bottom pie crust in a deep-dish pie plate. Stir together peaches, cranberry sauce, sugar, flour and, if needed, oats. Pour into prepared crust. Dot with butter and top with second crust. Bake for 40-45 minutes. Cover edges of pie crust with foil if the top is browning too quickly. Let cool for about 15 minutes before serving. Next week I’ll announce the winner of the DVD giveaway. In the meantime, I hope you enjoy a wonderful Thanksgiving with your loved ones. 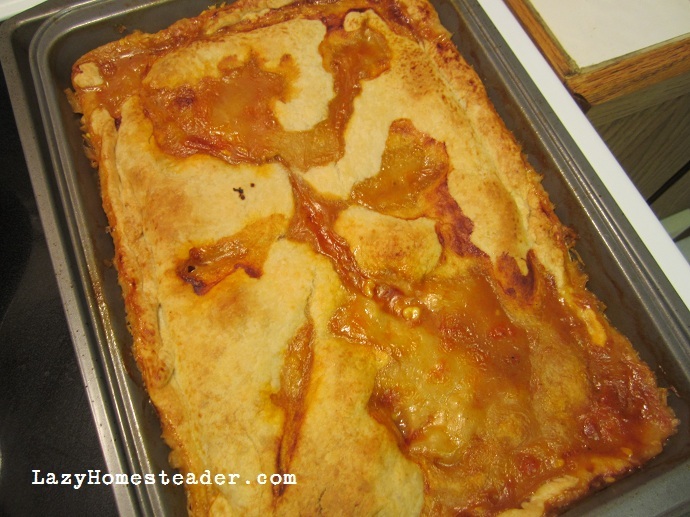 Here is another recipe from this year’s hunting trip. It’s a potpie that I made ahead and froze so that up at the cabin, all we had to do was pop it in the oven. This recipe was originally inspired by a chicken potpie recipe I found in my Everyday Food magazine. I use dusky (blue) grouse in this recipe, but pheasant or other upland birds would be just as tasty. You can certainly also substitute chicken or some leftover Thanksgiving turkey. Before making this recipe, I clean and cook the grouse to make a stock. In a large pot, add the grouse, an onion (chopped), celery, garlic, parsley and salt. If you skinned your grouse, add a tablespoon or so of olive oil. Cover everything with water and simmer for an hour or more until the meat is fall-off-the-bone tender and the broth is flavorful. Remove the grouse from the pot, shred the meat, and strain the broth. I usually end up with more broth than I need for this recipe. I freeze any extra for later use. When we make the potpie, we try to use all locally grown ingredients (with the exception of the chili powder). We use green chiles and corn frozen from our summer CSA, onions and garlic from the garden, and tomatoes we canned ourselves. I like to use hot Chimayo chili powder from New Mexico. Melt butter in a large pot or deep-sided skillet over med-high heat. 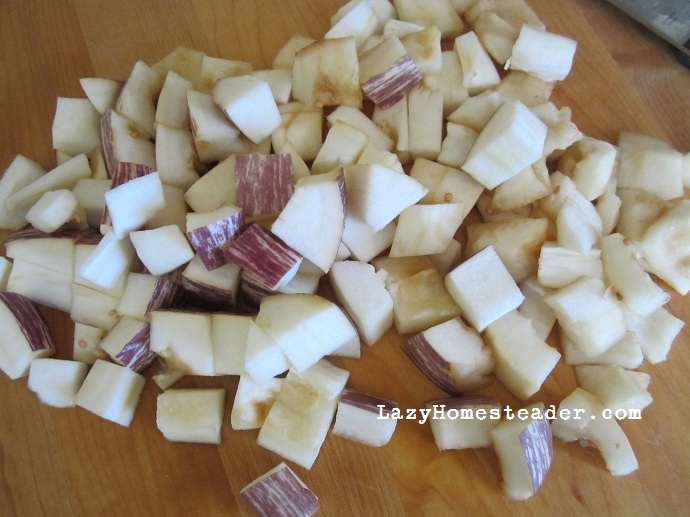 Add onion and cook, stirring frequently, until soft and translucent, about 10 minutes. Add garlic and chili powder, and cook about 30 seconds until fragrant. Stir in flour and cook until all the onion is well coated. Pour in the broth and tomato juice, whisking to make sure there are no lumps of flour. Add tomatoes. Bring to a boil, reduce heat and simmer until thickened, about 10 minutes. Season with salt. 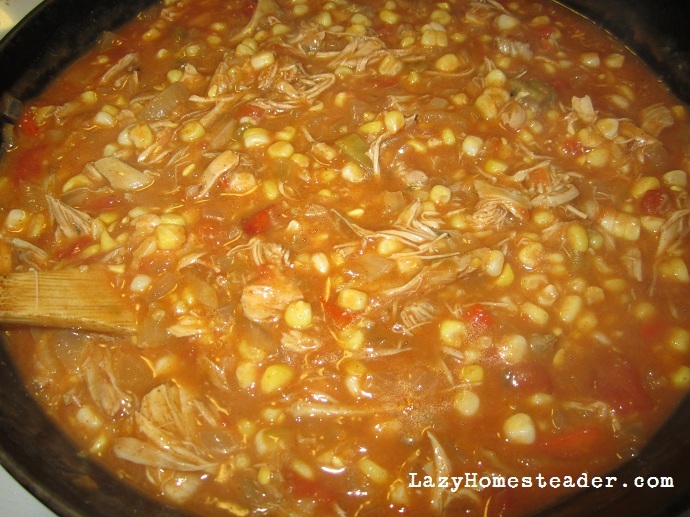 Stir in corn, chiles and grouse. Preheat oven to 375°. On a floured work surface, roll out the pie crust to ⅛-inch thickness. Transfer filling to a 9×13 pan (or other two-quart baking dish). Top the pan with the crust, folding over the edges. 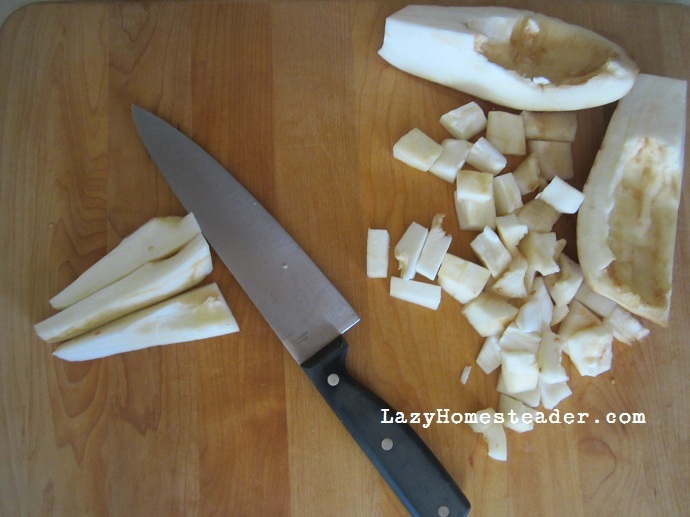 With a sharp knife, cut slits in the crust. Place the pan on a baking sheet (to catch any spills), and bake for 40-50 minutes until the crust is golden and the filling is bubbling. Remove pot pie from the oven and let cool for 15 minutes before serving. The potpie can be assembled and frozen ahead of time. To bake from frozen, bake for 1-¼ hours at 425°. Make sure to enter the Old Fed Co. “Ax Skills for the Homestead and Wilderness Survival” DVD giveaway before November 21, 2012! We just got home from our annual week-long hunting trip. While hunting is a big deal in our family, the trip itself is a lot of fun for other reasons. One of them is that my sister-in-law an I love to cook. Here is one of the recipes we had last week up at the cabin. It’s one of Rick’s favorites, that I’m happy to share. Place sweet potatoes in a medium pot and add water just to cover. Bring to a boil, reduce heat and cook for 15-20 minutes until the potatoes are tender. Drain the potatoes and return them to the pot. Use a potato masher to mash the potatoes. Add the cream, syrup and bourbon with a pinch of salt to the potatoes and mix well. Serve hot with a seared back strap and a simple green salad. Some years are corn years and some are melon years. This year is the year of the eggplant. I keep seeing pictures of beautiful aubergines all over Facebook, from the West coast all the way to New York. Local Kitchen has called it “Eggplantocalypse 2012,” a term which totally cracks me up. It seems like eggplant is either a love-it or hate-it fruit. I think a lot of people want to love it, because lets face it, eggplant is beautiful. 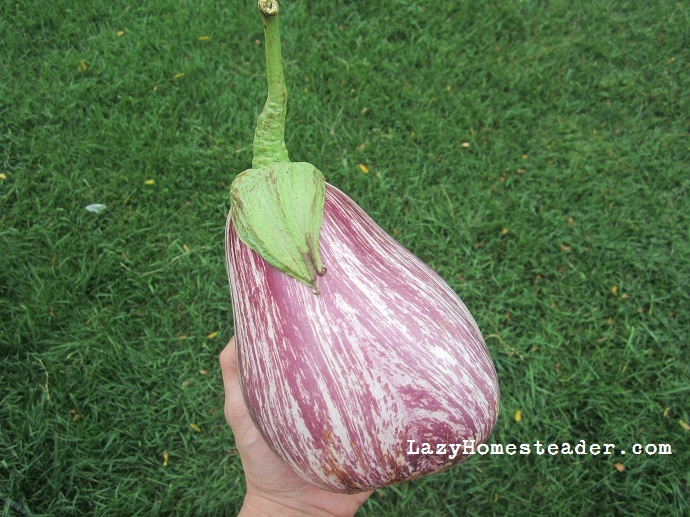 I received this amazing Nubia eggplant in my CSA share last week. The problem is eggplant tends – heavily – toward the bitter. 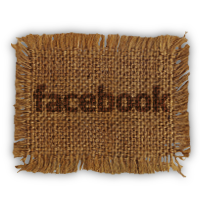 Coupled with its weird texture, it just becomes hard to palate. Eggplant also has a thick, rubbery skin. Unless I really feel sentimental about its pretty color, I usually peel it completely. I will at the very least peel half. In general, the skin is a bit too tough to really enjoy. I’ve heard all about salting eggplant to help remove the bitterness, but honestly, I don’t like this process. I’ve never felt it helped all that much, plus it takes too long. I recently read a novel in which a French man taught a young South American boy to cut and cook an eggplant. The Frenchman told the boy to remove the seeds. The boy forgot, but cut the eggplant so beautifully, the man did not care. This got me thinking, “How would one remove the seeds from an eggplant? Why would you, since they are totally edible.” But then I remembered that eggplant is a member of the nightshade family. It’s the same plant family as tomatoes and peppers. The pith and seeds of bell peppers are bitter. I decided to try it. 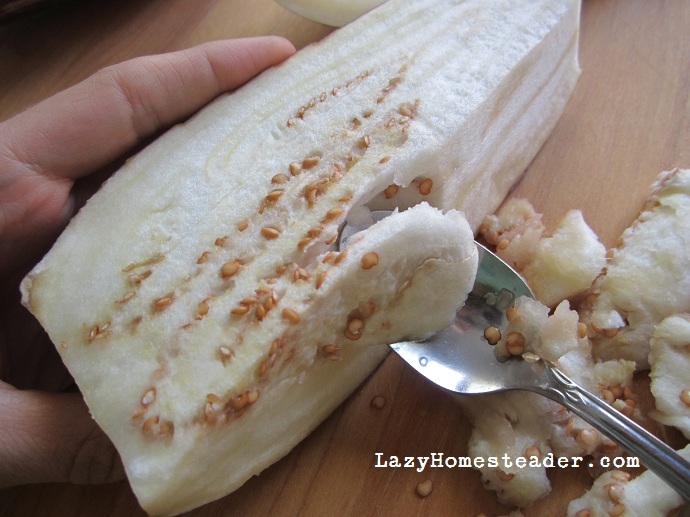 I sliced my eggplant length-wise and used a spoon to scrape out as many seeds as I could. Then I chopped it and cooked it up in some ratatouille. It was sweet and delicious. Could it have been a fluke!? Rick suggested I try it again to prove my theory. So I did, again and again. All summer long, we’ve been enjoying sweet eggplant… without salting it. 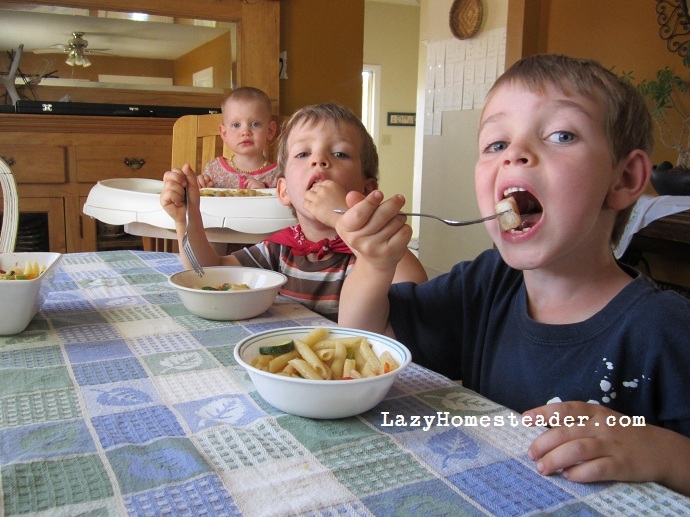 I felt like I discovered a whole new way to get kids to eat eggplant! Wait, no… I know how to get people to eat eggplant! It’s magic!! I know how to remove the bitterness from eggplant! I searched online to see if anyone else knew about this. There wasn’t much, although I did discover that eggplant is also related to tobacco and that is why the seeds are so bitter. 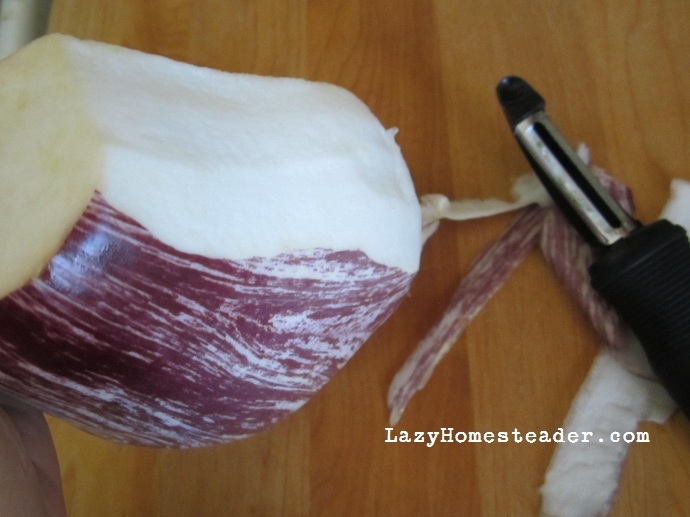 There are a few applications when seeding an eggplant is not really desirable, like eggplant parmesan or for a pizza. For those recipes I use a Japanese eggplant instead, as they tend to be less bitter to start with. For everything else, seeding is the way to go for me. 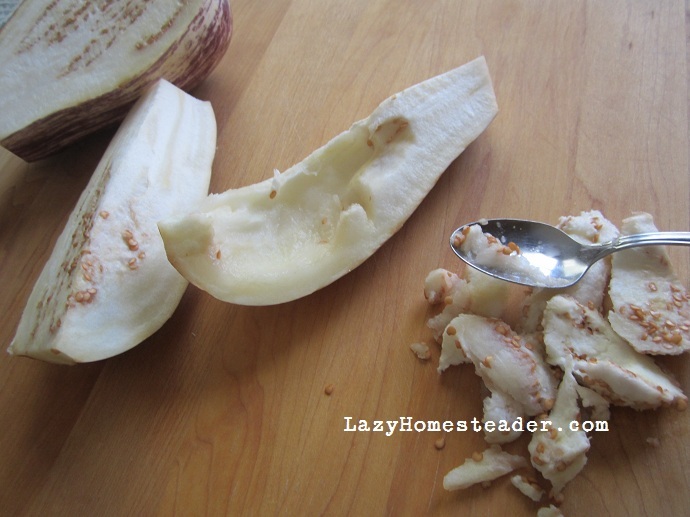 Slice, peel and seed eggplant. Seed and chop pepper, halve and slice zucchini and chop tomato. Combine and toss all with olive oil, salt and pepper in a shallow pan. Roast in a medium-hot oven (375-400°) for 20-30 minutes, until the vegetables are crisp-tender, being careful not to over cook. If the eggplant roasts too long it will become mushy. Meanwhile, boil pasta in salted water until al dente. Reserve 1/3- to ½-cup pasta water and drain. 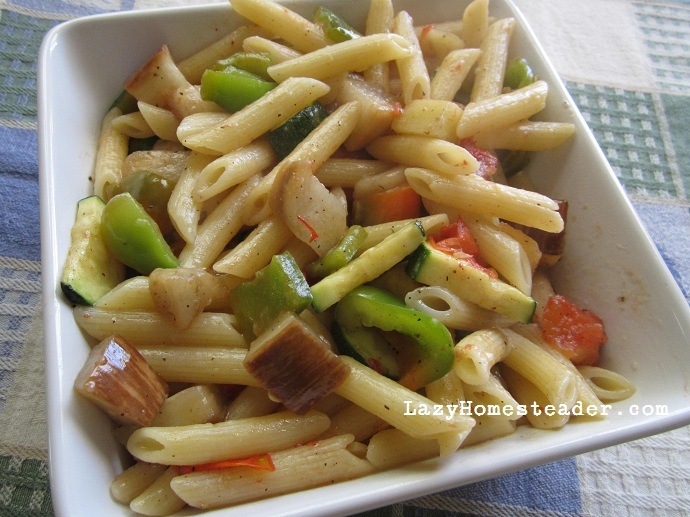 Toss cooked pasta with roasted vegetables and reserved pasta water. Enjoy. 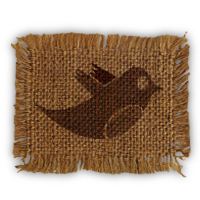 From the Native Americans to The Hunger Games, people have carried jerky. You know that if the zombie apocalypse hits, you’ll want some too. I’m so excited that Erica at Northwest Edible Life has allowed me to do a guest post on her blog about my favorite way to preserve meat. Rick got this recipe from his mom. All the men in Rick’s family are big-time hunters, and my mom-in-law is the designated jerky maker for the family. Her sons, brothers and dad all drop meat off at her house to have her transform it into this good stuff. I’m sharing the secret recipe over at Northwest Edible. 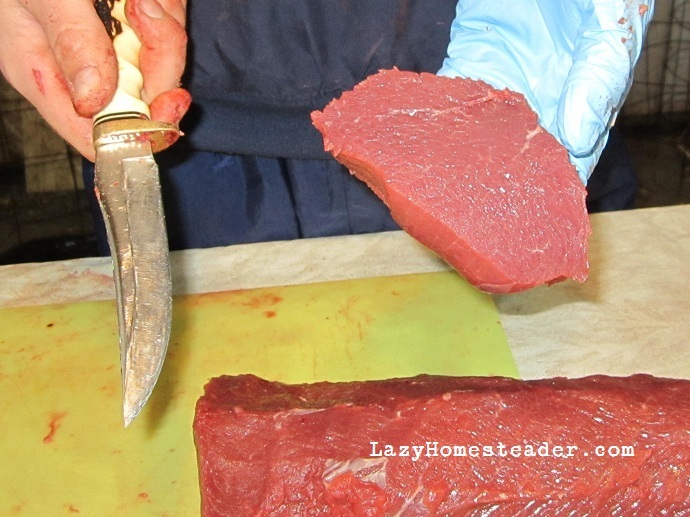 Every so often I publish a blog post either about hunting or with a picture of an elk steak in it. Usually after this I get at least one or two questions about how to prepare game meat so that it doesn’t taste so “gamey.” I hear lots of people saying they would hunt but they don’t like the taste of the meat, or that they just don’t know how to cook it. Likewise, whenever we serve game to friends and family, we get lots of surprised comments about how flavorful and good the meat is, not at all gamey as they expected. Since hunting season is just around the corner for many parts of the country, and since our family mainly eats game meat, I thought I’d share a bit about how we process and cook the meat, and how we deal with the “gaminess” of venison and other meats. Over the next couple of weeks I plan to publish a series of hunting related posts, including recipes for cooking wild game. Making wild game into a delicious meal was learned through trial and error over the last nine years of cooking and processing game. We’ve made some discoveries that have really helped us. When people refer to venison as gamey they are either speaking of the toughness or dryness that often occurs when cooking the meat, the distinctly wild flavor, or both. It’s a bit backwards but I’m going to talk about cooking game meat first. This addresses the toughness and dryness of venison. In part two, I’ll talk about harvesting and processing game and how that directly affects the taste of your meat. It might seem obvious, but deer, elk and antelope are all very different from cattle. When you cook beef, the fat and marbling you should look for when buying a steak keeps the meat moist, tender and flavorful. A delicious juicy steak depends on it’s fat. Nicely marbled beef can be tender and choice even cooked past medium. This is because cattle is mainly fed corn to fatten them up (literally, to fatten them). If you’ve ever cooked grass-fed beef, you know what I’m talking about. Grass-fed beef is leaner than conventional corn-fed beef. Often grass-fed beef is “finished” on corn (meaning the last few weeks of it’s life it gets corn to add in some fat). And even if it is not, grass-fed beef still has more fat than venison. Cows are bred to stand around and eat. Cattle ranchers make an effort to keep their cattle from using their muscles. Even if not confined, they don’t want them running around. They want lazy, fat, contented cows. They want tender muscle. 1,400 pounds of well-marbled, tender muscle. We all know a muscle that is exercised gets harder, tougher, stronger. 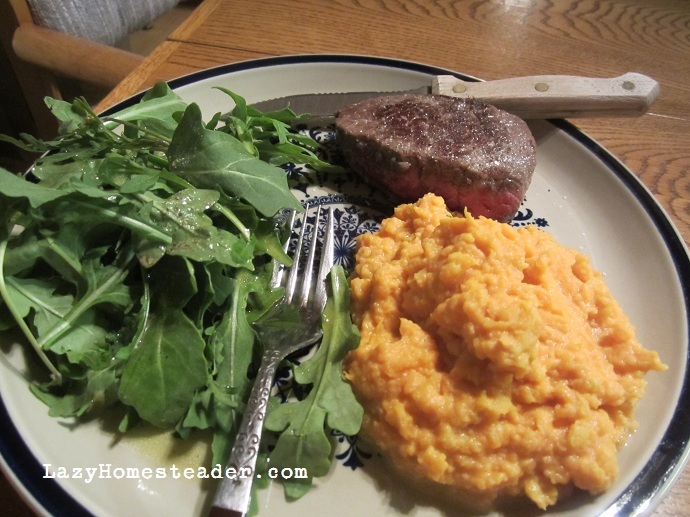 Elk fillet, same cut as beef shown above. Deer (and certainly antelope) don’t just stand around all day filling their stomachs. They live their lives using their muscles. They have to keep on the move, running and jumping, staying away from predators. They have to search out water and food. Their food is not usually a lush field of grass or corn (unless they are Nebraskan whitetail). It’s often patches of under-brush, sage and other soft-wooded plants. Deer eat twigs and bark and shoots. They are nearly fat-free beings, trim at 150 (or perhaps 400 for an elk) pounds, with the hardened muscles of athletes. This means you can not cook venison the same way as you cook beef. While you might like your beef steak medium- to medium-rare, your venison needs to be much closer to rare, else it becomes shoe leather. It generally should not be cooked well-done or it will be ruined, dry and tough. Likewise, grouse, pheasant and duck are not chickens. You must add fat when cooking grouse and pheasant. Duck is an entirely different bird and it’s breasts can be treated as red meat, cooked to medium-rare or medium. 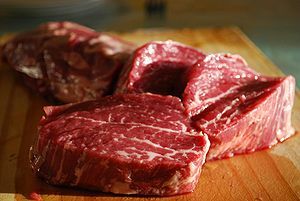 To start with, use thick cuts of meat. If you get your game processed by a butcher, ask them to cut your steaks an inch thick or thicker. Or if you process your meat yourself, use a ruler or make yourself a template when cutting, so your steaks don’t end up too thin. The idea here is to preserve moisture as much as possible and not over-cook the meat. Deer and elk steaks are going to be smaller than beef steaks anyway, so if your steaks are thicker, you have more leeway with this. Remember, you can always cut your meat thinner if you need to later, or for other uses as you get used to cooking your game. Venison greatly benefits from a marinade. Most of the time we, at the very least, drizzle our elk, deer or antelope steaks with olive oil and let them sit in it for 20 minutes to half an hour before we cook them. Olive oil, crushed garlic and thyme is a great, simple combination. Before cooking we also add fat to the pan (or grill). Heat your pan and add a bit more olive oil. Then cook the steak, flipping once, being careful not to over-cook it. Remember that venison is smaller and less forgiving than beef, so keep a close eye. Bacon grease and lard are delicious, traditional ways to add fat to your venison. 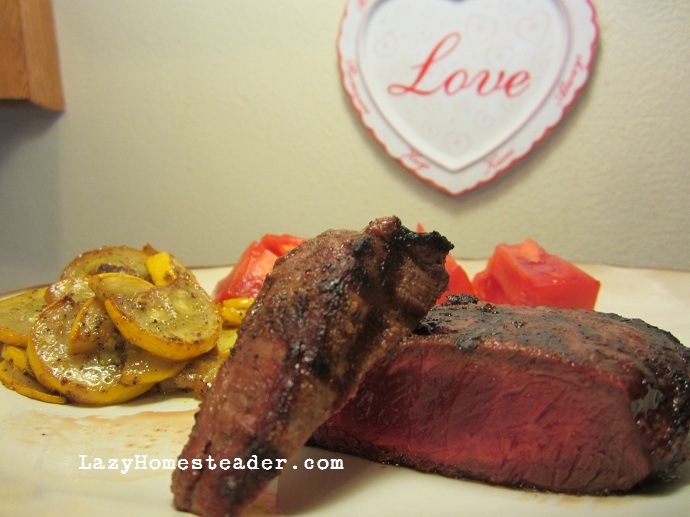 A lard-seared elk steak, to die for. Onions sauteed in bacon grease, the perfect base for a venison stew. Or keep it simple with olive oil. After cooking, let your venison steaks rest for up to ten minutes, covered, before serving. Notice that I didn’t mention salt? This is because salt draws moisture from meat. When cooking venison, salt should be added just before serving. Important to remember here is that you can’t just take a beef recipe and make it into a venison recipe without accounting for the leanness of the meat. You want to do your utmost to preserve the meat’s juices and moisture. If you enjoy stir-fry and fajitas, I recommend using a flank-type steak, cooked whole to medium-rare and then thinly slicing. Only add the sliced steak into the pan for the last few seconds (if at all). Check out websites like Field and Stream’s The Wild Chef blog or Hunter-Angler-Gardener-Cook for lots of delicious, trusted game recipes. 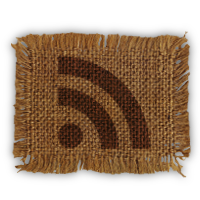 If you’ve enjoyed what I’ve posted about cooking wild game so far, please subscribe to have my future posts shown in your RSS feed or emailed directly to your inbox by using the form in the sidebar at the right. Thanks for reading.